Filou's has the look of comfortable suburban cafe, somewhere that, should you live nearby, would mean you had no need to keep fresh bread or coffee in the house. The homey feel comes from the hand-painted signage and residential locale; it stays in vogue with its sassy burnt-orange concrete and aqua wrought iron paint job. Filou's does a fine line in artisan breads, particularly sourdoughs. The baking smells that have wafted over to me on a late-night ride home have kept me eager to try it in the daytime. On weekdays they serve filled baguettes, which was actually exactly what I felt like on this sunny Saturday. 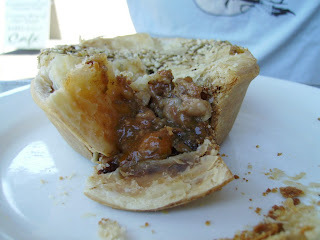 However, weekends are for decadence, a time to throw aside the lettuce and tomato extras and embrace flaky pastry! To that end, I plumped for the savoury baguette, avec jambon and fromage. They had cheekily sneaked in some veg within the darkened, buttery folds of pastry: tomato and leafy greens no less! 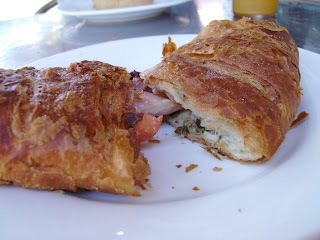 The ham had kept its flavour and the cheese wasn't so stringy that it took over from the pastry as the dominant texture. Paris is, alas, many moons behind me, but I was satisfied with this Melburnian version of the ubiquitous Gallic baked good. The beef and guinness pie was a little less exciting. Perhaps it was more in the French style; I can't profess to sampling them there. Then again, one does expect 'beef and guinness' to come in the style of a particular country. Vegies had again been snuck in amongst the sauce, and it was the sauce where care had been taken with flavour, more so than with the meat. Which, particulary for brunch, may be for some more acceptable. There's much more to be had from their bakers' oven: quiche, eclairs, muffins, tarts. Save time next time you're riding to a friend's and stop to fill your basket with some tres French goodies. The Pies are Bocastle not Filou's. Thanks for the info. I'd just assumed cos I was at a patisserie that everything with pastry was theirs! I've had some average experiences with Filou's so far. Dry crossaints that seem like they don't have nearly enough butter and french vanilla slice that is just a few hours shy of stale. A croissant has to be buttery, and a vanilla slice fresh: that's just the rules. I'll have to take my own advice and pop in for a sweet pastry and see how they stack up. The apple slice is fabulous. Unfortunately things are not quite the same since the Father of Filous sold the shop. The pastries are still pretty good but sometimes they are also pretty average. The sweets that have been there since the beginning continue to be good, but some of the newer items don't quite stack up! The savories have lost their appeal especially the mushroom slice. Its just a little too bland a bready. Thank god there is a new French pastry shop "Choukette" not too far away on Sydney rd. French owners, macaroons and all. It seems to be the consensus from the comments, that there is still stuff worth going for but it can be hit and miss. Cheers for the recommendation of Choukette. I think they have been making their own pies for a few months now. I tried one of the Beef and Burgundy recently and it was delicious. Golden butter pastry filled with plenty of large tender chunks of beef. I have been visitng Filous for about four years now and the new owners seem to be settling in and getting the hang of the place. The pastries have improved a lot in the last 6 months. I love seeing the owners friendly face when I visit, she is always very pleasant to chat with. Thanks for the comment. It could be time to head back. 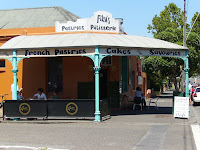 I loved Filou's (esp their brioche) and was devastated when we popped by the other day to find the doors all boarded up. Does anyone know what happened? Ooh, no I don't know what's happened. I know a car or something ran into it a few weeks ago - maybe it's just ongoing repairs from that? Went by there today and after almost year being closed after the big smash, there's finally a new sign up saying: reopening 7 October!